A retrovirus is a type of RNA virus that contains the enzyme reverse transcriptase, which allows its genetic information to be integrated into the host DNA. Retroviruses have a genome consisting of two RNA molecules, which may or may not be identical, from which they code for DNA. The genome of the retrovirus is then inserted into the DNA of a host cell with the help of an integrase enzyme. The process of transcribing RNA to DNA, which is accomplished by reverse transcriptase, is referred to as reverse transcription and it renders retro-viruses their name. Classically, according to a central dogma of molecular biology, transcription was thought to only occur from DNA to RNA, and then into proteins. The finding of the same endogenous retroviral sequences in the same positions on chromosomes of two different species offers support for the idea that evolution involved common ancestors and descent with modification, emphasizing a fundamental harmony among all organisms. Such retroviral sequences are evidences of a past viral infection of germ cells, which is then passed on to descendants. Retroviruses form by budding off of the cell membrane of host cells. They have an outer layering and are consequently described as enveloped viruses. 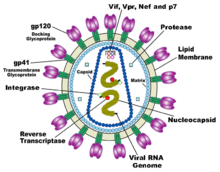 A common retrovirus is the Human Immunodeficiency Virus, commonly known as HIV and formerly known as HTLV-III. Human T-lymphotropic virus (HTLV), of which there are several species, is a human, single-stranded RNA retrovirus that causes T-cell leukemia and T-cell lymphoma in adults. A virus (Latin, poison) is a submicroscopic particle that can infect the cells of a biological organism. A virus stores its nucleic acid genome and serves as a means of delivery of that genome into cells it targets to serve as obligate parasites and constitutes an infection. The genome of an organism is defined as the hereditary information of that organism, which is encoded in the DNA or RNA and which serves as the template for translation of genes into proteins. An obligate parasite is an organism that cannot live independently of its host. Once in the host cell, the RNA strands of a retrovirus undergo reverse transcription in the cytosol (internal fluid of the cell) and are integrated into the host's genome, at which point the retroviral DNA is referred to as a provirus. Reverse transcription refers to the opposite of the normal transcription process that involves the synthesis of RNA from DNA. Hence, reverse transcription is the synthesis of double stranded DNA from RNA. Retroviruses rely on the enzyme reverse transcriptase to perform this reverse transcription of its genome, which is then integrated into the host's genome with the use of an integrase enzyme. The viral genes become part of the cell for its entire lifetime and reproduce as the host cell reproduces. Therefore, infections caused by viruses are usually lifelong. Retroviruses are enveloped viruses, meaning they have an outer layering derived from the membrane of its host cell. This outer lipid layer is studded with proteins coded for by the viral genome and host genome, although the lipid membrane itself is host-coded. It offers protection from harmful agents and the proteins may include glycoproteins that help healthy cells to recognize the invaders as "friendly," helping their uptake. Characteristics of the outer envelope have a major effect on what types of cells the virus can attack. Antibodies, which are created to prevent and fight viruses, are produced against the envelope and are found in vaccines. Retroviruses have a diameter of approximately 100 nanometers. Several genera of retroviruses exist, as listed below. These were previously divided into three subfamilies (Oncovirinae, Lentivirinae, and Spumavirinae), but with our current knowledge of retroviruses, this is no longer appropriate. Retroviruses can attack several types of cells, including somatic cells (body cells) and germ line cells (involved in reproduction). When retroviruses have integrated their genome into the germ line, their genome is passed on to the following generation. These endogenous retroviruses, contrasted with exogenous ones, now make up eight percent of the human genome. Most insertions have no known function and are often referred to as "junk DNA." However, many endogenous retroviruses play important roles in host biology, such as control of gene transcription, cell fusion during placental development in the course of the germination of an embryo, and resistance to exogenous retroviral infection. Endogenous retroviruses have also received special attention in the research of immunology-related pathologies, such as autoimmune diseases (body does not recognize self and consequently attacks itself) like multiple sclerosis, although endogenous retroviruses have not yet been proven to play any causal role in this class of disease. The role of endogenous retroviruses in human gene evolution is explored in a recent peer-reviewed article abstract. While transcription was classically thought to only occur from DNA to RNA, reverse transcriptase transcribes RNA into DNA. Reverse transcriptase activity outside of retroviruses has been found in almost all eukaryotes, enabling the generation and insertion of new copies of retrotransposons (mobile genetic elements) into the host genome. Because reverse transcription lacks the usual proofreading of DNA transcription, this kind of virus mutates very often. This enables the virus to grow resistant to antiviral pharmaceuticals quickly, and impedes, for example, the development of an effective vaccine against HIV. Thus far, four human retroviruses—HTLV 1 and 2, in conjunction with HIV 1 and 2—have been found to attack helper T cells, which "help" the immune response. Studies of retroviruses led to the first demonstrated synthesis of DNA from RNA templates, a fundamental mode for transferring genetic material that occurs in both eukaryotes and prokaryotes. It has been speculated that the RNA to DNA transcription processes used by retroviruses may have first caused DNA to be used as genetic material. In this model, cellular organisms adopted the more chemically stable DNA when retroviruses evolved to create DNA from the RNA templates. This page was last modified on 4 April 2008, at 00:31.